Boxcutters, Teaspoons, Jigger, Shaker Classic/Boston, Citrus Juicer, Strainer, Saucers, Rocks Glass. Add all ingredients to a cocktail shaker filled with ice. 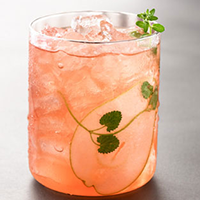 Shake vigorously, and strain into a rocks glass rimmed with sugar and filled with crushed ice. Present with mint leaves, dried pears or lemon confit.